Trustees’ attorney Suzanne Bostrom talked to reporters yesterday about the substance of the proposed legislation to open the Arctic National Wildlife Refuge. Her conclusion? 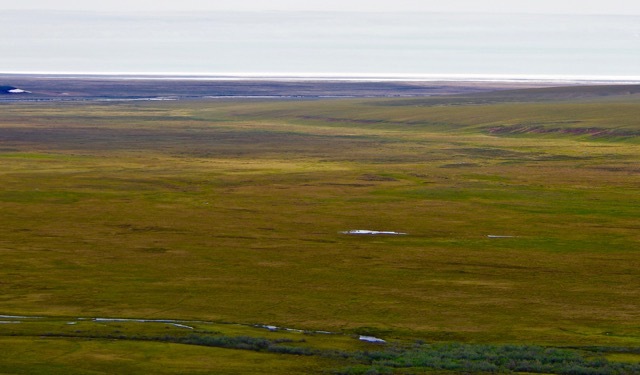 The Arctic drill bill will turn the Coastal Plain into the next Prudhoe Bay. Senator Murkowski has proposed legislation that opens the entire Arctic Refuge to oil and gas development. It mandates an aggressive oil and gas program on the Coastal Plain. It completely undermines the environmental protections and environmental laws that would otherwise apply. This bill would turn the biological heart of the Arctic Refuge and the crown jewel of the Wildlife Refuge System into an industrial zone. 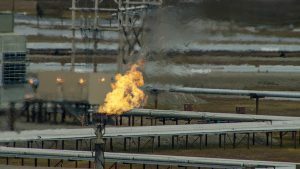 At the Senate Energy hearing two weeks ago, proponents of the bill said it would not waive or undermine environmental laws when opening the Coastal Plain to oil and gas development. The people pushing the bill also claimed that new technologies would allow development to move forward without harming fish and wildlife. These promises cannot and will not be met. 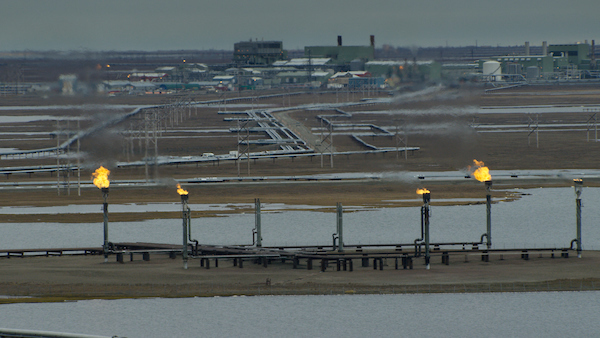 Development like that in Prudhoe Bay goes against the intent of the Refuge. Photo by Florian Schulz. This bill makes oil and gas development on the Coastal Plain one of the purposes of the Refuge, putting it completely at odds with the existing purposes to protect fish, wildlife, habitat, and subsistence use. The mission of the National Wildlife Refuge System as a whole is focused on the protection of wildlife. 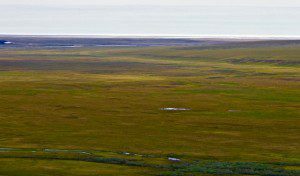 Oil and gas development on the Coastal Plain will destroy the existing purposes of the Arctic Refuge. It cuts against the mission and purpose of the Refuge system. It sets a dangerous precedent, and threatens the intent and values of all of our wildlife refuges. By adding oil and gas development to the purposes of the Refuge, the bill completely dismisses the protections currently found in the National Wildlife Refuge System Administration Act. Under that statute, U.S. Fish and Wildlife Service (FWS) can only allow uses in refuges that it finds compatible with the mission of the National Wildlife Refuge System. 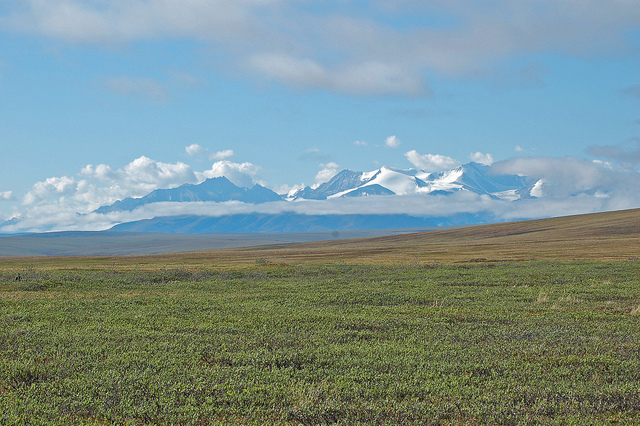 The Coastal Plain extends from the foothills of the Brooks Range to the Arctic Ocean. 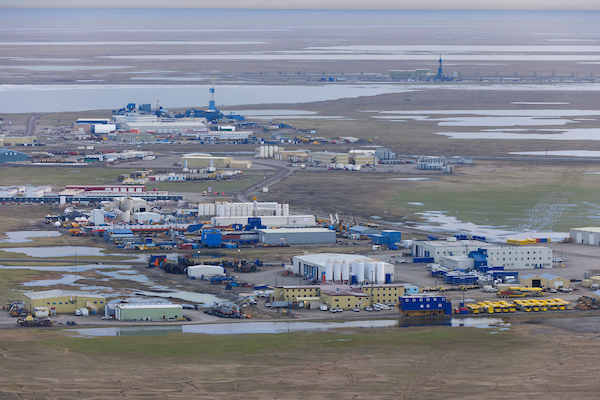 The Arctic drill bill will turn the Coastal Plain into the next Prudhoe Bay. Photo courtesy of Vance Carruth. 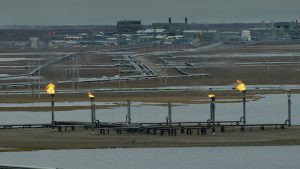 By making the oil and gas program a purpose and mandating oil and gas development in the Arctic Refuge, the bill severely limits the agency’s ability to protect fish and wildlife. The bill essentially creates inevitable conflicts between industrial development and conservation that will completely erode the original purposes of the Arctic Refuge. On top of that, the bill transfers authority over the oil and gas program to the Bureau of Land Management and changes the applicable laws to those that apply in the National Petroleum Reserve–Alaska. These provisions further erode Fish and Wildlife’s role and its ability to protect wildlife and subsistence uses in the Coastal Plain. The bill asserts that oil and gas development must occur, and that the authority to oversee development is handed over to BLM. The bill mandates an aggressive oil and gas-leasing program. Senator Murkowski’s proposal requires BLM to conduct at least two lease sales of at least 400,000 acres each within ten years. BLM will be required to offer areas based on their oil and gas potential, with no consideration of the importance of those areas to fish, wildlife, or subsistence use. Bill does not limit the footprint of things like roads and pipelines. Photo by Florian Schulz. The lease sale provisions contain zero protections and no language that protects or even considers of fish and wildlife. This restriction completely undercuts the purposes and applicability of the National Environmental Policy Act (NEPA) by removing BLM’s ability to say “no” to these lease sales—or to leasing in any areas on the Coastal Plain—no matter the potential impacts. The bill requires that BLM issue “any rights-of-way or easements across the Coastal Plain for the exploration, development, production, or transportation” of oil and gas. This means that the agency must issue any requested rights-of-way or easements, regardless of their potential impacts. This destructive provision could lead to a haphazard spider web of industrial activity across the Coastal Plain. It eviscerates the goal of NEPA by taking away informed decision making. The bill contains a meaningless and misleading 2,000-acre limitation on development. This provision does not actually limit the scope of development, but instead allows for industrialization of the entire Coastal Plain. Prudhoe Bay flaring. Photo by Florian Schulz. This language only addresses the surface acres covered by production and support facilities. It does not include roads or mines, and it does not include the actual footprint of the pipelines that could run for hundreds of miles across the coastal plain. It would at most include only the footprint of the posts supporting those pipelines. It would also not include a range of other harmful activities, like seismic exploration, which could cause severe and lasting damage to the Arctic Refuge. This bill would destroy the wilderness character and wildlife of the Coastal Plain. 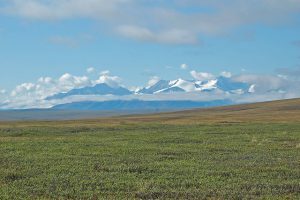 It strips away conservation protections, transfers management authority away from the fish and wildlife service—the very agency best equipped to uphold the protections intended for the Arctic Refuge—and it guts the application of laws designed to ensure good decision-making and the protection of the Refuge. The bill provides the legal authority to turn the biological heart of the Arctic Refuge into the next Prudhoe Bay.